Quanterion's 217Plus™:2015, Notice 1 Reliability Prediction Calculator has been developed to facilitate the failure rate calculation of up to ten (10) hardware assemblies, and fifteen (15) software assemblies, according to the component and system reliability models defined by Quanterion's 217Plus™:2015, Notice 1 methodology. All models are detailed in the 2015, Notice 1 version of the “Handbook of 217Plus Reliability Prediction Models” (HDBK-217Plus™:2015, Notice 1). 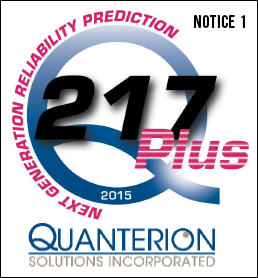 NOTE 1: If you currently own the Quanterion 217Plus™:2015 Handbook and/or Calculator, and you do not need to predict software reliability, then you do not need to update to 217Plus™:2015, Notice 1. NOTE 2: In order to take full advantage of the Neufelder Model within 217Plus™:2015, Notice 1, you will need to purchase a copy of IEEE Standard 1633-2016 “IEEE Recommended Practice on Software Reliability” from IEEE or an authorized distributor (Quanterion does not sell IEEE Standard 1633-2016). As an upgrade of the 217Plus™ method, 217Plus™:2015 provided several new component models, updates to model data, and refinements of several model equations. For Notice 1, the original software reliability prediction model has been replaced with the Neufelder Model for software reliability prediction as defined in IEEE Standard 1633-2016 “IEEE Recommended Practice on Software Reliability”. It is recommended that the user obtain a copy of the new 217Plus™:2015, Notice 1 Handbook for detailed information on these models, the model development background, and associated reference tables and equations. To take full advantage of the Neufelder Model within 217Plus™:2015, Notice 1, you will need to purchase a copy of IEEE Standard 1633-2016 “IEEE Recommended Practice on Software Reliability” from IEEE or an authorized distributor (Quanterion does not sell IEEE Standard 1633-2016). Quanterion also provides product support to all registered users of the original 217Plus™ or 217Plus™:2015 Calculators. An additive Software failure rate term, when applicable. Using this Calculator, each of these values may be calculated for a system of up to ten (10) hardware assemblies and fifteen (15) software assemblies. The Neufelder Assessment Model correlates more 156 software development practices to defect density which are matrixed to the Quanterion Solutions HDBK-217Plus™: 2015, Notice 1 process grade factors. Click Here to visit the Neufelder Assessment Model (You will be brought to an external website). Copyright © 2017 by Quanterion Solutions Incorporated. This publication was developed by Quanterion Solutions Incorporated, and the materials contained within are protected by U.S. Copyright Law and may not be copied, automated, resold or re-distributed to multiple users without the express written permission of Quanterion Solutions Incorporated. If copying, automating, reselling or re-distribution of this copyrighted material is desired, please contact 877.808.0097 (toll free) or 315.732.0097 for licensing information. Neufelder Model © 2017 by SoftRel, LLC. Licensed to Quanterion Solutions and used by permission.